Imperforate, bluish wove paper, no watermark, engraved. 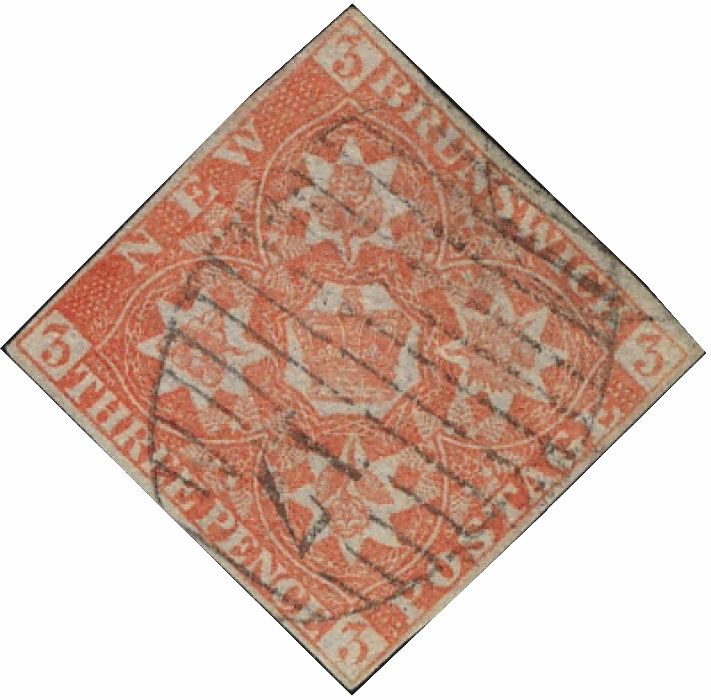 The stamps were withdrawn after New Brunswick, Nova Scotia and the Province of Canada formed the Dominion of Canada on July 1, 1867. The number of stamps issued are estimated, based on a simple calculation. Remainders with a face value of approximately $12,000 were destroyed in a fire in the customs house in St. John in 1891. Assuming an even distribution according to the printed quantities, we reach the numbers in the # issued column. The weightings are about 72.06% 3 pence, 18.27% 6 pence and 9.67% 1 shilling stamps. The number of stamps destroyed is therefore estimated at about 271,577 or 47.7% of all the stamps printed. The stamps were printed in sheets of 160 with the paper makes watermark, T. H. Saunders, appearing once at the edge of the sheet. Only the 3 pence stamps can be found showing this watermark. See article in First Issues April 2008 (V16N2), page 5 and 8.